Also known as rose of Sharon, althea (Hibiscus syriacus) brings bright color to the garden in late summer or fall. Plant this deciduous shrub in full sun for the best flower display. Althea adapts to nearly any type of well-draining soil and grows in U.S. Department of Agriculture plant hardiness zones 5 through 8. Although althea is generally a well-behaved plant it is considered invasive in some areas. 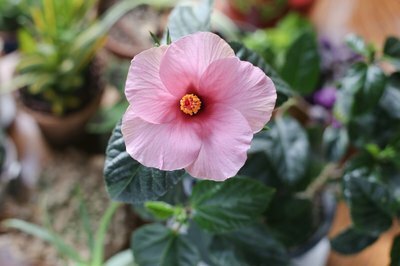 Proper planting is the key to a healthy, beautiful althea shrub. To plant althea, dig a hole two to three times the width of the plant's root ball, but no deeper than the height of the root ball. Place the shrub in the hole with the top of the root ball even with or slightly higher than the surface of the surrounding soil. Fill in around the root ball with the excavated soil, then tamp the soil to remove air pockets. 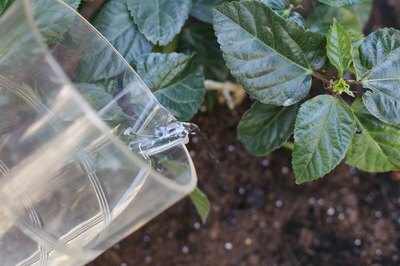 Water the shrub slowly to a depth of 8 to 10 inches. Space althea shrubs 6 to 10 feet apart. They eventually grow to 10 feet tall and 6 feet wide. Water althea once or twice per week during dry weather, or whenever the top 4 to 5 inches of soil feel dry to the touch. Water the shrub deeply and slowly to a depth of at least 12 inches, using a garden hose or soaker. Never water the shrub if the soil feels damp because too much moisture increases the risk of root rot. Spread a 2- to 3-inch layer of organic mulch, such as bark chips or pine needles, under the shrub to conserve moisture and keep the roots cool. Fertilize althea in spring and again in late fall. The plant benefits from a dry fertilizer formulated for acid-loving plants, with a ratio such as 4-3-4. 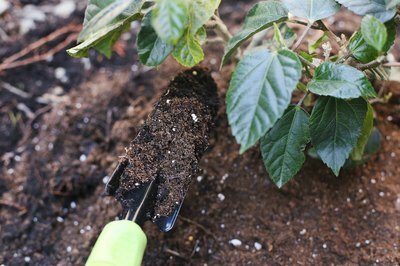 To determine the amount of fertilizer, measure the width of the shrub at its widest part, then apply 1/2 cup of fertilizer for each 1 foot of width. Broadcast the fertilizer evenly over the soil around the shrub, then water deeply. Alternatively, use a water-soluble fertilizer with a ratio such as 30-10-10 every one to two weeks. Apply the fertilizer at a rate of 1 tablespoon for each 1 gallon of water. Althea doesn't absolutely require pruning and unpruned shrubs develop an attractive vase shape. A light pruning before new growth emerges in spring improves flowering. 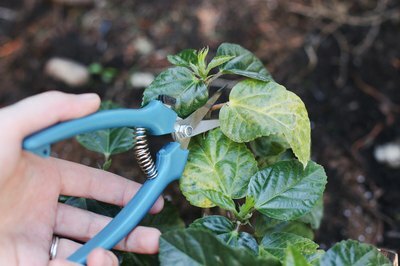 Prune weak growth and broken or winter-damaged branches, then remove up to one-third of the oldest branches at or slightly above ground level. Never lop off the top of the plant in an attempt to limit height because the shrub will develop an unsightly, unnatural shape. Sanitize pruning tools before and after pruning by wiping them with rubbing alcohol or soaking them for five minutes in a mixture of 1 part bleach to 9 parts water. Althea is susceptible to flower bud drop, which happens when soil moisture levels fluctuate widely. Regular watering helps prevent this. Leaf spot, a common fungal disease that affects althea, can be treated with a sulfur plant fungicide. Sulfur fungicides are available as a fine powder, which you dust over the leaves. You can also mix the dust with water at a rate of 3 tablespoons per 1 gallon of water and apply it with a garden sprayer. Apply the dust or spray every 10 to 14 days, as needed. Althea is relatively pest-resistant but it is sometimes bothered by aphids or spider mites. 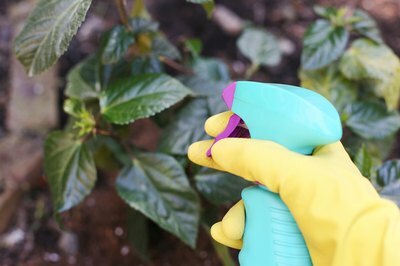 To control the pests, spray the plant with a ready-to-use insecticidal soap spray until all leaf surfaces are covered. Repeat every seven to 10 days, until the infestation is under control. Neither fungicides nor insecticidal soap should be used when temperatures are above 90 degrees Fahrenheit, or when the sun is shining directly on the plant. Wear eye protection, protective gloves, long sleeves, long pants and sturdy shoes when applying garden chemicals.